SleuthSayers: Chekhov Wrote Crime Stories? 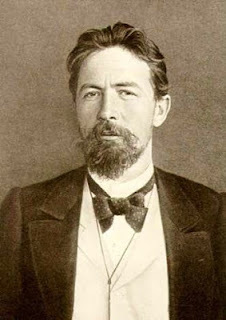 I never thought of Chekhov, one of my favorite short story writers, as a writer of crime or mystery stories. Of course, if writers use their experiences as material for stories, then it shouldn’t be a surprise that Chekhov tried his hand at writing crime stories. I decided to buy the book after reading the review by Otto Penzler in the New York paper The Sun back in 2008. The name of the editor who selected the stories for the book is not shown. The name of the translator, Peter Sekirin, is, so I assume he was also the person who selected the stories. Why he included the essay “What You Usually Find In Novels” in which Chekhov lists the elements that go into a novel– character, setting, conflict– is a mystery. Why he chose some of the stories is also a mystery since they are not, properly speaking, crime stories. Anyway, for this article, I analyzed what I think are two crime stories and two mystery stories. “Evildoer” captures the mind of the Russian peasant and Russian officials. Since the crime has already been committed, the story is more a court room drama told in short form. A fisherman is on trial for the crime of unscrewing the nuts that hold down the railroad tracks. He explains to the judge that he uses the nuts as weights for his fishing lines. His explanation baffles the judge who can't believe it and tries to explain to him that unscrewing the nuts causes train wrecks. The fisherman doesn't believe the judge’s explanation and doesn't understand why he is being sent to prison. I like this story because it shows a good story doesn’t always need a surprise ending, only a satisfactory one. ”Misfortune,” one of the best stories in the book, shows Chekhov’s storytelling genius. In a few words, he captures a disastrous moment in a man’s life due to his lack of understanding that signing reports makes him legally responsible for their accuracy. A merchant is a member of the town bank's auditing committee. After the director, accountant, his assistant, and two members of the board are sent to prison for embezzlement, a later investigation reveals the merchant signed the reports. He admits he didn't understand them. He also doesn't understand that signing the reports made him complicit in the embezzlement. Again, no surprise ending but a great story. “The Swedish Match” is a true locked room mystery with a surprise ending. A retired police officer is missing from his room and believed to have been murdered, but the body cannot be found. It appears the killer entered the room through a window and that the dead man was taken from the room through the same window. Suspects are his sister, his mistress, his butler, and his manager who reported the murder. The surprise ending is not exactly starling but it works. The detective story “The Drama At The Hunt: From Notes of A Police Detective” is an abridged version of what seems to be a novella that has a good surprise ending. It has all the ingredients of a good murder mystery: a promiscuous woman, three men who are involved with her, and jealousy: a 19-year-old woman is hit on the head and stabbed several times. Her husband is tried and convicted for the murder. In the last chapter, which is somewhat confusing, the narrator changes from the investigating detective to a book editor to whom he has submitted the manuscript of a novel based on what he claims is a true story. The abridgment of the novella makes it choppy and at time confusing. Nevertheless, it is the best story in the book, if only it hadn’t been abridged. I liked some of the stories, but I was disappointed overall in the selection of tales. I’m no linguist and certainly can’t read Russian, but at times I felt the translation wasn’t quite right. Still, I enjoyed those few good stories. Wow! I didn't know any of those. I tend to think of Chekhov as the master of slice-of-life literary fiction and not genre. Very impressive, Louis, and quite a classic mystery. Louis, I located my 1929 copyright by Walter J. Black, Inc. of THE WORKS OF ANTON CHEKHOV and looked for the four stories you mentioned. Like you, I found some problems with the translation. You mentioned "The Swedish Match," but in my copy it's called "The Safety Match" and your long title about the hunt and the detective is called "The Shooting Party" in my copy. I didn't find the other two stories by title, but then they may also have been translated differently. Chekhov wrote some great stories, but whoever translated into English made it into some laborius reading. This bibliography and this list of short stories might help. The latter has links to free on-line e-texts. R. T., Glad to know that I’m not the only reader who felt a problem with some of the translations. Thanks to librarian for the list. It will help with my building a digital collection of Chekhov’s stories. It shows good writers aren't locked into one style, no matter what the public thinks. Jimi Hendrix said he wanted to be a bluesman, but the public narrowly thought of him as slash guitar. Very interesting, Louis! Chekhov is one of my favorites as well--thanks for the review. Louis, thanks for a great post with a lot of interesting info I wouldn't have guessed at. I got the book when it came out, I still haven't read my way through it!